Talent Jam - Work it Watauga made its’ first debut on Thursday, April 4, 2019 at Ransom in downtown Boone. With approximately 175 attendees and 27 official pitchers the event was a huge success! The event was informative, engaging, fast paced and really fun for attendees. Talent Jam - Work It Watauga was presented by Silicon Hollar, in partnership with Appalachian State University - Career Development Center, Boone Chamber of Commerce, Blowing Rock Chamber of Commerce, The Watauga County Economic Development Commission and NC IDEA Foundation. Special thanks to our wonderful beer sponsors, Booneshine Brewing Co. & Lost Province Brewing Co. as well as our awesome host, Ransom! Talent Jam - Work it Watauga authentically connects our local talent and the organizations that need them in ways that traditional networking events or job fairs simply don’t. This was a high-energy, hyperlocal event that featured dueling, open-mic pitches where companies looking for talent, and people that have talent, each deliver alternating 60-second pitches. The event was followed by a casual but impactful networking reception where many connections were made! A local Photovoice project brought to you by AppHealthCare highlighting the importance of inclusion, specifically employing individuals abilities was also on display at Talent Jam - Work it Watauga. Stay tuned for more information about the next Talent Jam - Work it Watauga coming this fall! Velocity Labs is a 3-month startup accelerator divided into two distinct 6-week tracts for founders and teams of pre-revenue and early adopter stage high-growth companies. Velocity works closely with a select group of entrepreneurs in the earliest stages with the proven Customer Development framework to discover a valid solution for a problem worth solving for a sizable population that’s big enough to build a scalable, profitable and impactful company. Customer Development recognizes a startup is a temporary organization built to search for the answers to what makes a repeatable & scalable business model. Entrepreneurs will test a series of unproven hypothesis (guesses) about their business model: who the customers are, what the product features should be, and how this scales into a hugely successful company. The peer-to-peer course will engage insightful discussion among the diverse group of startup entrepreneurs while creating accountability, personal leadership, increased productivity and an accelerated learning platform to give companies the necessary velocity to reach the critical growth and scale stages. The first six-week tract (Spring 2019) is all about Customer Discovery and is for the earliest stage companies, typically pre-revenue, working on product ideation, business model concepts, market analysis and the critical problem/solution fit stage. Companies will understand deeply what the big problem is they are working to solve and specifically for which customer segment(s). Founders will use the Value Proposition Canvas to help test their own assumptions about the problem and the solution directly with a number of potential customers, explore direct competitors and how their value proposition is unique, and analyze the true size and value of the potential market. Companies will be able to confidently measure whether they have true problem/solution fit before moving on to Customer Validation in the second six-week tract to prove out product/market fit. The course culminates in a community pitch event to allow founders the opportunity pitch their validated business model concepts and gain support from the High Country startup community. The second six-week tract (Summer 2019) is for the early stage companies that have validated that they have problem/solution fit and are engaging with a small early adopter customer base. Using the Customer Validation framework and Business Model Canvas, companies will build and test a minimal viable product (MVP) with a growing number of early adopters as they ramp up into and validate true product/market fit. Companies will gain a deep understanding of early adopter engagement, sales funnel and channel development, early revenue generation, market positioning and growth metrics that matter. The course culminates in a community pitch event to allow founders the opportunity pitch their early stage company to the community, investors and mentors to gain support from the High Country startup community. Rolling Applications with Final Deadline March 15th, 2019. Last Thursday, we kicked off 2019 at Hatchet Coffee’s new space for the January Silicon Hollar Startup Social! 50+ local entrepreneurs, community members, and business owners gathered at Hatchet to enjoy specialty coffee, local brews and networking. Special thanks to our monthly drink sponsors, Appalachian Mountain Brewery, Booneshine Brewing Co. and Hatchet! Startup Social attendees enjoyed open networking and many took part in getting a free professional headshot. We would like to thank J. Chew Photography for the awesome set up and providing free head shots for local entrepreneurs at this event! Everyone gathered around and James Bance, Co-Founder of Startup High Country opened us up with quick Silicon Hollar updates and by thanking our host and drink sponsors. Jeremy Bollman, co-founder of Hatchet Coffee took the floor to discuss their new space and the exciting new opportunities instore for the community at their coffee shop. Starting this week, Hatchet will host Pop-up Coworking on Tuesday evenings from 6-8 PM to accommodate local entrepreneurs. Brandon Hall, co-founder of ChurchLearn discussed their startup business and that they officially launched their friends and family raise opportunity! They have had great traction as a company and with the Friends and Family round. Email brandon@churchlearn.com for more info! Joe Furman from Watauga EDC mentioned the NC Rural Center Thread Capital Lending opportunity for small businesses. Thread Capital provides small businesses access to the capital, coaching and connections they need. Apply now! James Wilkes, CEO of Hive Tracks is launching a crowdfunded documentary, Chasing Sourwood. Stay tuned for more info on this awesome business venture! Sullivan Wilkes, James’ son and business partner mentioned his Backyard Beehive endeavor where he provides hive keeping, consulting and sells bees/honey. Jeffrey Scott, Co-Founder of Startup High Country discussed last year’s Velocity Labs course and that because of grant funding there will be another course coming this spring! Learn more and apply here. Jeffrey is also facilitating an upcoming Mountain Bizworks Invested Course: An Investment Crowdfunding Learning Journey beginning later this week! Learn more and apply here. Chris Grasinger, another Co-Founder of Startup High Country mentioned Mountain Bizworks Boone Foundations Course coming up in February that will be facilitated by Athalia Whitworth. Learn more and apply here. Miah Zimmerman, Owner of Canvas Beauty Bar recently launched her new social networking website for the beauty industry, canvassocial.com. Be sure to check it out! Taylor Drouet with The Dynamic Body is introducing a new class series called Balanced Bodies Bootcamp(B3). The intention of the class is for you to feel more confident and alive in your body. This dynamic high energy series focuses on building core strength, stability, and mobility while training healthy joints and healthy bodies. Taylor also does Massage Therapy and teaches private lessons for Functional Movement. All of these modalities focus on unwinding into freedom, access, and ease so that you can love living in your body. Please call or email Taylor if you have any questions or you want schedule an appointment. 541-510-8487, healingthedynamicbody@gmail.com. Christina Bailey invited everyone to attend Boone’s Winter Farmers Market every 1st and 3rd Saturday through April. She also mentioned Blue Ridge Women in Agriculture’s upcoming Farm to Table Dinner Series at local restaurants! Christina invites everyone to shop local through the High Country Food Hub as well! David Jackson, President/CEO of Boone Area Chamber of Commerce added that the High Country Food Hub (recent Velocity Labs graduate) was also just named BAC Startup Business of the Year! Davis Parker is launching a new mobile app called Draba in March at Black Cat in downtown Boone! Draba is a curated digital marketplace that connects buyers to unique creative goods and services, provided by local sellers. 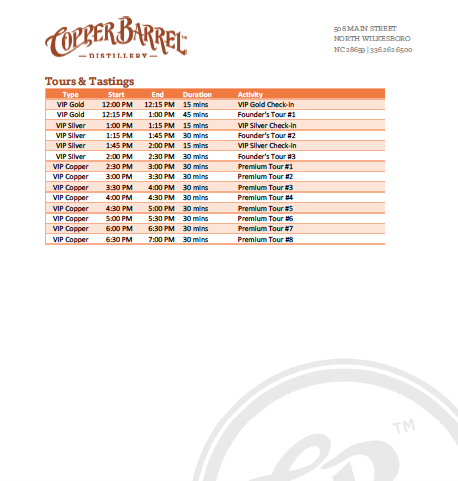 George Smith, President/CEO of Copper Barrel Distillery would like to personally extend a warm invitation for Silicon Hollar members and friends to participate in Copper Barrel’s Anniversary Celebration on Saturday, April 20, 2019! There are a few vendor spots left, so those who would like to showcase their products at the event should fill out and submit a Vendor Application. This event is a fundraiser for the Fallen Outdoors. Please see a summary of the planned activities below. This year’s event is shaping up to be our biggest and most successful yet! Tickets will be available to purchase on Eventbrite within the next week or so. Please do not hesitate to contact George directly (at 704-269-8697) if you have any questions or need additional information. Erich Schlenker, Managing Director of the Transportation Insight Center for Entrepreneurship mentioned their upcoming Ideation Workshop on February 21st. More details to come. Dallas from Great State Brewery and Wired Man Coffee Shop, both located in Wilkesboro invited everyone to make a trip down the mountain to enjoy a coffee or a beer in a great atmosphere! Thanks again to all those that attended this month’s event! Thank you for always supporting our entrepreneurial efforts here in the High Country. Stay tuned for information regarding our February Startup Social! Are you a local business owner or entrepreneur? Where do you typically spend your working hours? Your home, favorite coffee shop, another office space? You’ve likely already heard about, or have been too, one of the Silicon Hollar weekly Pop-Up Co-working sessions at Ransom (and now at Hatchet Coffee on Tuesdays in January). At the pop-ups, people can stop by, get some work done, have some coffee and visit with other local entrepreneurs and professionals. We have seen a great network of High Country entrepreneurs in attendance each week and look forward to expanding to our secondary location for this month, Hatchet Coffee. The next phase of growth for Silicon Hollar is to help establish a permanent location for co-working in Boone. We are currently working with various local entities to create a new space in Boone for startups, small businesses and solopreneurs, where they can have a dedicated desk, or office, and work in a collaborative environment. Route Coworking, a project of Watauga EDC, Silicon Hollar and High Country Local First, will be a space to start, house and grow local companies in the High Country. Route aims to provide low cost, professional workspaces, in a setting designed to foster creativity, collaboration and access support services for your business. We are a dedicated community of entrepreneurs that see untapped value in connecting with other young businesses in the High Country. We’d love for you to join us! Please take a few minutes to complete this Boone Co-working Survey so that we can get feedback from local entrepreneurs interested in this project! Please complete the survey before January 9, 2018.